In lakes, pools, and rivers, much more local than E. canadensis. Usually a distinctive small- (or at least narrow-) leaved plant more delicate than the much more common E. canadensis. Occasionally the two may grow in the same body of water. 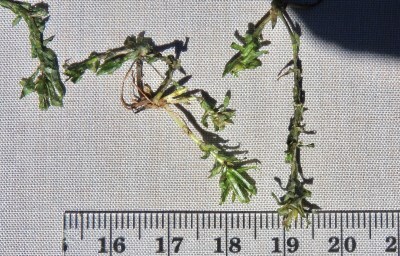 In some forms the leaves are rather delicate, narrow, 5–10 times as long as wide; in others the leaves (especially on flowering branches) are short (scarcely 5 mm long), stiffish and often ± recurved, the length/width ratio as in E. canadensis but the leaves smaller and less imbricate than in that species. Staminate material is apparently more common than in E. canadensis, and careful examination will usually reveal spathes, making identification possible. MICHIGAN FLORA ONLINE. A. A. Reznicek, E. G. Voss, & B. S. Walters. February 2011. University of Michigan. Web. 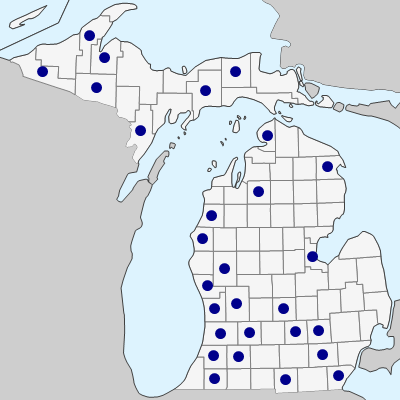 April 18, 2019. https://michiganflora.net/species.aspx?id=1448.